Mrs. Monica Prusinowski, 99, of Conrath Avenue, Salamanca, NY, died Monday, February 4, 2019 at the home of her daughter in State College, PA.
Born May 4, 1919 in Syracuse, NY, she was the daughter of the late Adam and Jennie Neiman Weis. She was married in St. Lucy’s Roman Catholic Church, Syracuse, NY on May 3, 1941 to Andrew M. Prusinowski, who predeceased her on March 31, 2000. Mrs. Prusinowski was a high school graduate in Syracuse. She had been employed with the Salamanca Central School District working in food service for over twenty years, retiring in 1984. Mrs. Prusinowski was a member of the Our Lady of Peace Parish and the Salamanca Bowling Association. She enjoyed spending time with her family, especially her grandchildren. 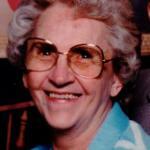 She liked needlework and was an avid card player. Surviving are: three daughters, Joan (James) Farina, Richmond, VA, Peggy (David) Carley, Rochester, NY, Paula (Larry) Schul of State College, PA; a son, Andrew “Marty” (Christine) Prunsinowski, Sandy Hook, VA; fifteen grandchildren; thirteen great-grandchildren; two great-great-granddaughters; several nieces and nephews. She was predeceased by two sisters, Helen Prusinowski, Virginia Judge, two brothers, Norbert Weiss, Leonard Weiss, and two stepbrothers, Carl Weiss and Adam Weiss. Friends may call at the O’Rourke & O’Rourke Inc. Funeral Home, 25 River Street, Salamanca, NY on Friday, February 8, 2019 from 6 – 8 p.m.
A prayer service will be held in the funeral home on Saturday at 9:30 a.m. followed by a Mass of Christian Burial in Our Lady of Peace Parish with Rev. Mariusz Sierhart, pastor, as celebrant. In lieu of flowers, the family suggests memorials to Roswell Park Cancer Institute, St. Jude Children’s Hospital, or the Multiple Sclerosis Society.